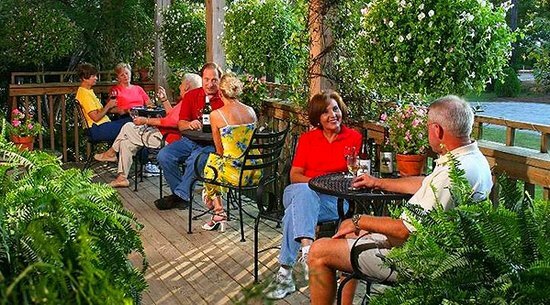 Myrtle Beach isn’t atop of many wine connoisseur and craft beer geek’s lists, but the Grand Strand area boasts three commercial vineyards, a handful of wineries, a microbrewery, and three brew pubs with beer crafted on site. Betcha didn’t know that did ya’? Throw in a variety of ever-growing local wine and beer festivals, and the Grand Strand has expanded its vino and hops-and-barley offerings significantly in the last decade. But this wouldn’t be Myrtle Beach if there weren’t some quirks. Because wine-producing grapes don’t fare well in our Coastal climate and terrain, Myrtle Beach wineries have turned to muscadines which thrive in the sandy soil. 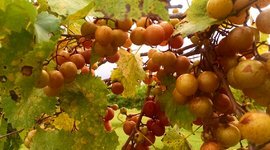 Muscadines are a kind of grape native to the Eastern and Southern US and are described as “naturally sweet” and sometimes dubbed “dessert wines.” Besides the recommendations below here are a few other great Myrtle Beach wineries to explore. 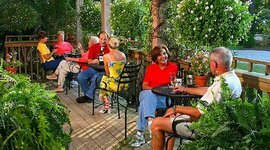 La Belle Amie is a hot spot for local wine lovers and tourists alike as the owners of this Myrtle Beach winery fling their doors open to the public, hosting weekly events, seasonal festivals, tours, and tastings on a regular basis. La Belle Amie produces its own wine label – Twisted Sisters – boosted with grapes from nearby North Carolina, along with several muscadine wines. They operate a tasting room, and wine tastings are available daily 10 am – 5:30 pm (except Sundays). Because of South Carolina law, La Belle Amie can’t give out free wine samples, but for $3 you can sample any six wines of your choice. Self-guided tours of the vineyard are available 10 am – 4 pm daily (except Sundays). Guided tours for groups of less than 15 people are conducted 11 am Tuesdays and Thursdays, but you must call (number listed below) to reserve a spot. 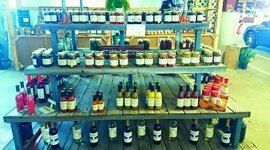 A natural products company that also produces jams, juices, and syrups, Hyman Vineyards is a Myrtle Beach winery located in an inland rural section of Horry County west of Conway. They specialize in growing three varieties of muscadine grapes: Noble, Doreen and Carlos. 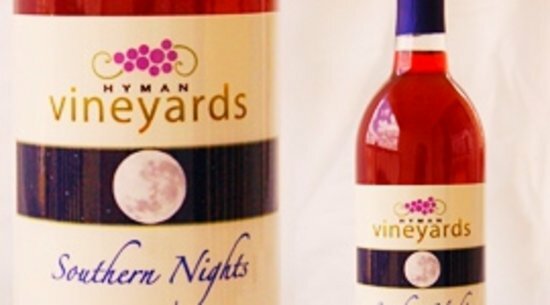 Hyman produces three muscadine wines: Southern Sunrise (blush), Southern Sunshine (white, dry), and Southern Nights (red, dry). According to the vineyard’s website, “Our tasting room is temporally closed.” Apparently, planned tours of the vineyard’s winery which were supposed to open in late 2008, “where visitors may view Hyman Vineyards’ line of sweet muscadine wines being made,” didn’t work out either. Instead, you can find Hyman’s wines at the Pee Dee State Farmers Market, 2513 West Lucas Street, Florence, SC 29501. Also specializing in muscadine wine, Grapefull Sisters is a vineyard, winery and destination all wrapped into one, with an on-site inn and campground. Sounds good if you’ve sampled too much nectar, eh? The vineyards wines include: Tabor’s Choice Red, Waccamaw White, and Southern Charm. Wine tastings are held 1-6 pm Monday through Saturday and are $6 per person. The vineyard hosts many events and festivals in tandem with CarrollWoods Campground. Tours are conducted by the owner when available. Bus and limo tours of the vineyard area are also available. Recent changes to South Carolina law have made it easier for Myrtle Beach breweries and brewpubs to grow their slices of beer tourism (yes, that is a thing). Founded in 1998 and dubbed “the Beer from here,” it’s mind-boggling that many locals, much less tourists, know about the New South brewery, tucked away in an industrial section of Myrtle Beach. You can’t get much more crafty than this award-winning craft beer production facility that also features tours, a tasting room (basically a bar), retail sales and some really cool laid-back brewmasters that love to talk beer. New South’s flagship brew is its White Ale, an interpretation of the Belgian wheat ale, but the Myrtle Beach brewery also produces a Lager, Nut Brown Ale, Stout, Dark Star Porter, IPA, Oktoberfest (August-November), and various seasonals. You can tour the facility at 3 pm Tuesdays and Thursdays, as the Web site puts it, “to see our production process, get complimentary samples of our beer, enjoy draft pours, and take home a little New South with our six-packs, growlers, T-shirts and other beer gear.” No reservations required and there’s no entry fee (but bring your wallet to purchase pints, six-packs, and growlers). Liberty is the Grand Strand’s longest-running brew pub and complements its American comfort food with a rotating array of specialty, home-brewed beers. Stalwarts include Rockets Red Ale, White Ale, Unfiltered Wheat, Nut Brown Ale and Miss Liberty Lager, along with limited, small-batch varieties. Tip: Happy Hour (4-7 pm daily) is when you want to slide by Liberty, with $2.75 pints and $9 pitchers, along with great deals on soft pretzels and other munchies. Please note that Happy Hour specials are only available in the bar area and the outdoor beer garden. Beer flights are also available. The bar and sprawling restaurant are centered around the brewing system and large vats, and you can tour the facility too. 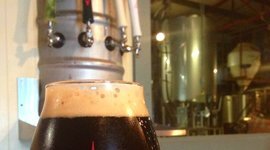 Tours of this Myrtle Beach Brewery and pub are given in the morning (before noon) generally, but call ahead (phone number listed below) to make sure that the brewer will be in during the time you want to come. 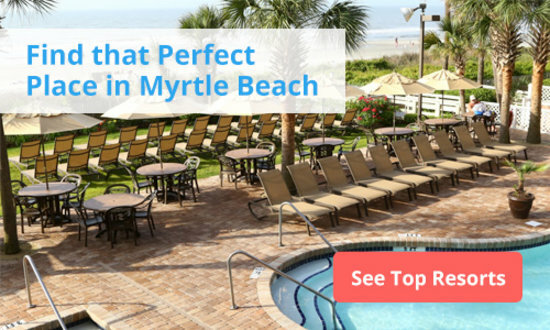 This is a national chain but it’s all about consistency and tradition, as this Myrtle Beach brewery adheres to the so-called “German Purity Law” known as Reinheitsgebot. This means that fresh ingredients are mandated for all their beer brewed on site. 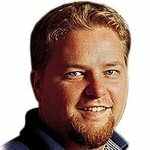 Tip: Order the beer flight – a sampling of four Gordon Biersch brews – with a handy placemat chart that tells you all about the brewing and ingredients. The regular tap rotation includes the Golden Export, Hefeweizen, Schwarzbier, Marzen, and Czech Pilsner. 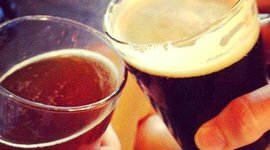 The Myrtle Beach Gordon Biersch regularly hosts tapping parties for the release of new and seasonal beers, along with contests and parties. Tours of the brewing chambers are also available by calling ahead. The South Strand’s only brewpub, Quigley’s was established in 2007 by Michael Benton and namesake Josh Quigley, former head brewer at Liberty Brewery and Steakhouse and co-founder of New South Brewing. 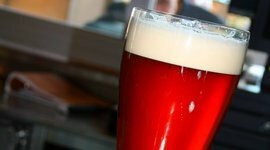 Quigley’s features a rotation of its signature beers brewed on site, which include Peach Wheat, Longboard Lager, Neck Red Ale, Nut Brown Ale, Shakedown Wheat, Swamp Fox IPA, along with seasonal and special batch brews. 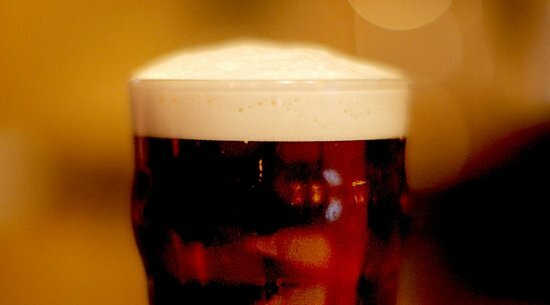 Happy hour is from 4-7 pm daily featuring $2 pints. Tip: The day to visit Quigley’s bar is Wednesday, when you can get growler (64-ounce jug) fill-ups of fresh, hand-crafted beer for just $5. However, Quigley’s brewing equipment is somewhat small and inconspicuous and not really on display, so tours of this Myrtle Beach brewery are not offered. An hour drive from Myrtle Beach, this farmers market sells the freshest produce in the state on fifty-acres of former farmland. Vineyard, winery, and campground all in one. Stop by for their tastings, and if you have too much, just pitch your tent for a nap. They sell juices, jams, and syrups, but are known more for their sweet muscadine wines. Pick up a bottle at Pee Dees Farmers Market. It's tucked away, hidden almost in an industrial section of town. But don't let that deter you. Come by for tastings or tours with their laid-back, friendly brewer masters. It's a nice family-friendly brewpub in the South Strand. Grab a bite to eat, beer, or get a growler (64-ounce jug) for fill-ups of fresh, handcrafted beer.